(From Canon lens literature) Canon EF 85mm focal-length lenses are traditionally very sought-after options for portrait photographers. With that in mind, Canon is expanding its EF 85mm line up with the introduction of the new Canon EF 85mm f/1.4L IS USM; the first Canon EF 85mm lens to feature image stabilization, providing up to four stops* of shake correction for smooth and crisp imagery. The New Canon EF 85mm f/1.4 L IS USM is scheduled to be available November 2017 for an estimated retail price of US$1599. Purple fringe is still there. Weight. 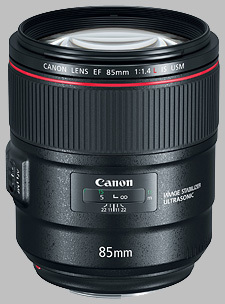 Canon finally offers a professional 85 without any quirks. The legacy 85L (1.2) was slow to focus and had (to my eyes) unacceptable purple fringe in high contrast lines below 2. The 1980's era 85USM (1.8) is a charming lightweight lens with fast AF but image quality below 2.8 isn't up to the demands of modern high resolution sensors (softness and purple fringe). On both a 5DmkIV and 7DmkII, the new 85 is sharp, great for low (or no) aperture shooting, and is quick to focus in marginal conditions. There's IS for video production (we leave turned off for stills shooting). Disappointingly, at this price, the purple fringe is still there (but greatly reduced) and the weight gets noticeable during a long day of shooting. Canon shooters get a great 85, as good as any available today.